Looking for a metal flush mount return grill? Look no further. Currently available in a 4 x 12 size but comes in 6 styles with a frame to match standard ¾” tongue and groove red oak hardwood flooring. These metal flush mount vents come with a steel (pewter finish) insert that has a lacquer topcoat to protect the metal. If you would like to change the color you can purchase Rustoleum Professional Spray paint at your local hardware store and change the color to match your décor. These metal and wood flush mount grilles do not contain adjustable dampers but you can purchase a sheet magnet and stick it to the back of the flush mount vent to adjust air flow. Install on most any floor type with tongue and groove:solid hardwood, engineered hardwood, laminate, and tile. These decorative floor vent covers can also be used in thinner floating floors by not installing it with the frame and just installing the metal grill. These faceplates alone will fit a 3/8” thick flooring all the way down to 1/8” thick flooring. The metal faceplates are 1/8” thick with ¼” wood rails on the back to make them taller. If you need them shorter them the 3/8” simply sand down the rails on the back to the height needed. Reminder: These metal flush mount floor grills must be installed when you are installing your hardwood floors. When ordering your metal and wood flush ount grill, you must take the measurement of your wall hole opening. 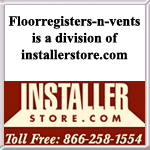 This decorative floor vent cover is made to be used with 4" x 12" ductwork. 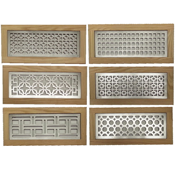 Choose these beautiful and hard-to-find metal flush mount vents for your home today! Looking for a more traditional wood flush mount? We offer many different sizes and wood species in a flush mount vent.